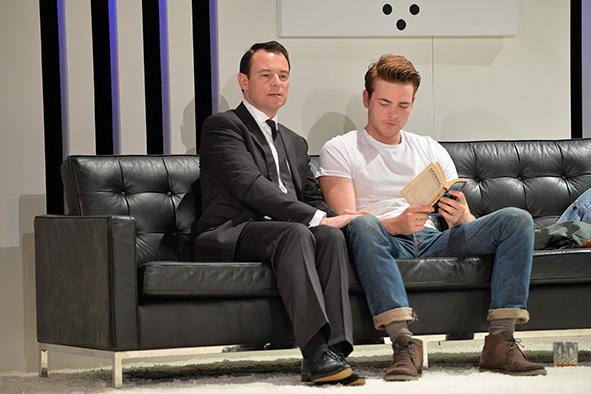 Historians oft claim not enough has been made of the importance of Brian Epstein’s role in the rise of The Beatles and this play poses educated, hypothetical scenarios as to what Epstein may have been going through in the days leading up to his premature death on Aug bank holiday weekend ‘67, at the tender age of 32. 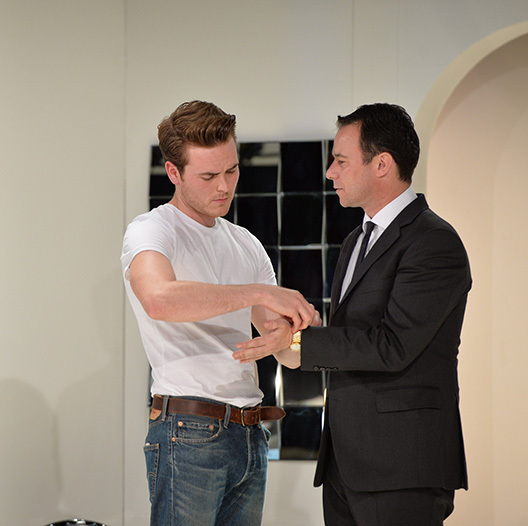 More factional than fictional, it draws on Epstein’s own words in some of its’ finest moments, such as a scene in which actor Andrew Lancel as Epstein recreates a telephone call Epstein made to America to ‘sell the group’ in which his humility, integrity and total belief in his ‘Boys’ rendered his requests undeniable. The fact that Epstein’s voice exuded a knowing, calm refinement at its most persuasive was a definite plus. Through his evocative performance, Lancel is as much that elegant, sad, raging, full of decorum, regret and longing man as any actor could ever hope to be, and given his physical resemblance to Epstein, those watching could easily forget that he’s an actor, being a person who was once, nearly as well known as the pop group he’d made world famous. As I abandoned my failing (in more ways than one) TV over a decade ago in favour of living life first hand, I’m unable to comment on Lancel’s television proficiency. I can confirm however, that in my humble opinion his acting in this play, is informal aka natural enough to warrant formal recognition. Epstein had a vulnerability that never deserted him; it was always there, on his face. While Lancel doesn’t naturally exude that, his Epstein, nonetheless, exudes it through his focused, to the point of abandoning ‘technique’, performance, due, in part, to Jen Heye’s directing, which, it thankfully seems, must have been more of a guiding hand than a tightly reigned affair, ironically reflecting Epstein’s own guidance of The Beatles, once they’d left their mark and begun to come of age. Lancel has quite a challenge in Epstein, a man torn between pride over his Boys and fear they might not renew their contract with him, rage and trembling insecurity, who must, at all costs, somehow, maintain a level front. This pressure is palpable the way Lancel plays it, bringing us into Epstein’s troubled private life, a place where we feel empathy and at times, pity for him, along with genuine amazement at all he accomplished. Despite his fluctuations, Epstein broke down barriers, not just in the London centric UK, but also in the US, where it was initially believed UK records wouldn’t sell. Being Jewish and gay in working men’s Liverpool, where neither was the norm, would have assured prejudices against Epstein, so his air of vulnerability would have been understandable. Lancel manages to bring Epstein to life in ways that seem somehow familiar, yet apart, as Epstein himself felt. Conveying the inner feelings of another onstage is a rare thing and the successful achievement of that is due to group efforts of Lancel, his director, Jen Heyes and Andrew Sherlock, who has achieved through his writing, a real sense of the inwardly tortured man Brian Epstein was. The fact that Epstein recognised the great artistic potential lurking beneath the surface of four rough around the edges Liverpool lads, although he professed to have no interest in pop music and his background and fields of experience were quite different from theirs speaks of his talent for, showcasing talent, a paradox for a man who, in himself was quite lonely and however outwardly kitted out, inwardly, often felt like an outcast. Lancel as Epstein manages to capture his comingled certainty and doubt, a man who is competent and gets things done, but is, in reality, ever veering towards the edge. To belong and be needed seemed to be Epstein’s chief needs and for a time, it seemed those needs were being satisfied, managing ‘The Boys,’ as he called them. This elegant, seemingly, unassuming man who found it difficult to stand up for him-self in some cases, never found it difficult to fight for what he believed in outside of himself, and he believed in The Beatles. Having no significant other, at a time when homosexuality was still a crime in Britain, until just a month before his untimely death, Epstein’s love life amounted to a serious of ‘boys’ picked up in bars and brought home to his Belgravia flat, where his body was discovered by his housekeeper on Aug. 27, 1967. One such boy, ‘This Boy’ like the song title, in the play, a moniker indicating that there is something different about this particular boy, is well played by Will Finlason, who though from Manchester, swings a Liverpool accent with souse authenticity. His fresh faced good looks too, are very much in keeping with the 60’s time of young, cinematic anti-heroes like Tom Courtenay and Albert Finney. The fact that Epstein wants to dress This Boy in Beatles clothing is bittersweet, as it seems as though he is trying to resurrect the lost ‘spirit of Liverpool youth,’ as playwright Andrew Sherlock views him, to return to happier, perhaps, to him at least, more innocent times. Such scenes are treated with great sensitivity and depth by both actors and Sherlock’s sometimes surprising, well-paced script, only rings false in moments when it leans too heavily on Beatles’ clichés via overworked use of song titles within the context of some of Finalson’s character’s sentences. Then again, This Boy is meant to be a genuine Beatles fanatic, who knows the ins and outs of their careers and personalities as much as magazines, newspapers and an ear on the street would be capable of informing him. However, such deviations deserve a second look, as they’re the only thing that detracts in any way from the otherwise, true life tone of Sherlock’s authentic feeling script. Lancel and Finalson are foils for one another, This Boy being the device enabling Epstein to speak of the highs and lows of his life to the audience overhearing them. It’s not surprising that This Boy is initially, lurking with journalistic intent, hoping to cop a newspaper job, as he mirrors Bill Harry’s Mersey Beat DIY paper, born after failed attempts to interest the nationals in the Mersey scene. Thanks to both actors emotive flair, it’s understood that, despite class differences, the main thing they share is their inner compassion. This is never more apparent than when, during one of Epstein’s mood swings, more frequent near the end of his life, This Boy remains genuinely concerned, despite Epstein’s tendency towards violence and, masochism. This play may also prove cathartic for those who’ve dealt with mental health/addiction issues themselves or are dealing with someone who is. The setting, Epstein’s minimalist, pop art influenced Belgravia flat, enhances his quest for self-knowledge, in that it is so stylishly banal, it functions as a blank canvas of sorts. This banality lends itself nicely to tastefully low-key, intermittent projections on its’ walls, like fleeting memories or inner workings, which contrast and/or, enhance outward appearances. Nothing is held back in this production, so Epstein’s increasing, open reliance on pills reaches the point where we come to the sad realisation that to him, such over self-medicating had by that time, become commonplace. It’s said there are no coincidences, though a series of them lead this play to its current London run, beginning with its author, Andrew Sherlock’s late night conversations with his father in law, Geoff Hogarth, one of the original owners of the Iron Door Club, a jazz and beat venue where The Beatles played at times at the height of their Mersey fame, despite the fact that they were a ‘Cavern Club’ band, to the production’s birth in the newly named Epstein Theatre in Liverpool, as part of the 50th Anniversary celebrations of The Beatles there. Which, is where we first realised the play existed, on our maiden voyage to Liverpool for the purpose of writing a Feature about The Beatles and their legacy there. With every moment in that all too brief journey pre-planned and a hope in the back of our minds that the play would one day, come to London, we visited The Beatles Story, recreated Cavern Club on Matthew Street, took the Magical Mystery tour bus past Penny Lane and Strawberry Fields and visited the childhood homes of John Lennon and Paul McCartney. In the little box bedroom of young John Lennon at Mendips, he and his Aunt Mimi’s former home, and the 1950’s council house living room of the McCartney’s, we were struck by disbelief that boys from such humble beginnings went on to become world famous music icons. 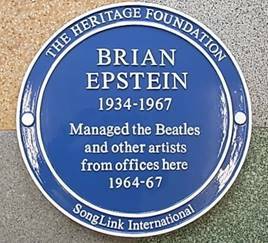 Brian Epstein made that happen! A black and white snapshot, taken by Paul’s brother, Mike in the McCartney’s living room, of teenage Paul and John, heads bent over a notepad they were jotting lyrics in, brought that home. Through this play and its sensitive acting, Beatles fans will gain insight into an integral part of their story that is too often, overlooked, even if they believe they know all there is to know about Epstein, as sensing the presence of the man is far more memorable than reading words. Theatre-lovers, simply thirsting for top notch acting, aligned with attuned directing and an intelligent script, enacted via a collaborative labour of love will also be gratified. If you’re into all of the above, you’ll be gladder still that you went to the time and trouble to take in this very worthy, and, timely production, in light of Epstein’s posthumous induction into the Rock and Roll Hall of Fame earlier this year and blue plaque commemorating his London office near the Palladium, recently unveiled by Andrew Lancel, so convincingly and respectfully playing him now, along with This Boy, Will Finlason.